The sports initiative is a vital component of the development policy of the St Vincent and the Grenadines Diaspora Committee of New York, Inc â a policy which seeks to build Vincentian diaspora institutions in the USA. The participants in the meeting reflected on several themes including: the policy of the Diaspora Committee to promote and build Vincentian diaspora institutions in the USA; the growth and development of the sports initiative of the Diaspora Committee; the benefits of a Vincentian diaspora sports association in the USA; the establishment of a sports fund; the creation of a Steering Committee that would work towards the establishment of a Vincentian sports association in the USA; and the plans and ideas of new Sports Ambassador Stanley âLuxyâ Morris. The major outcome of the meeting was the creation a 15-member Steering Committee which will work towards the establishment of a Vincentian diaspora sports association in the USA. The 15 members are: Stella Boyea-Ashby, Gailene Windsor, Stefferny Boyce-Herbert, Stanley âLuxyâ Morris, David âSkiesâ Llewellyn, Atiba Williams, Damani Thomas, Artis Nicholls, Gary âTunkerâ Edwards, Allyson Seales, Brendon Sutherland, Ronald Bailey, Maxwell Haywood, Dennika Peters, and Toni Johnson. Participants in the meeting represented various sporting disciplines such as soccer, cricket, netball, track and field, tennis, and basketball. They also represented sports administration and the sports component of the media. Participants heard presentations from Maxwell Haywood, chairperson of the St Vincent and the Grenadines Diaspora Committee of New York, Inc; Samuel âKalaâ Gordon, coordinator of the Sub-Committee on Sports of the St Vincent and the Grenadines Diaspora Committee of New York, Inc; Peter âPuskieâ Burke, member of the St Vincent and the Grenadines Diaspora Committee of New York, Inc; and Stanley âLuxyâ Morris, St Vincent and the Grenadines Sports Ambassador. 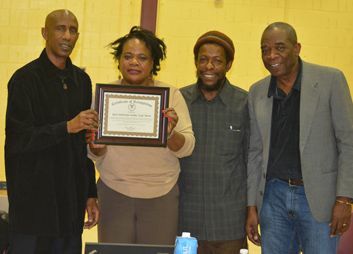 Presentations were also done by Gailene Windsor, member of the St Vincent and the Grenadines Diaspora Committee of New York, Inc; and Glenroy âGobelsâ Phillips, vice-chairperson of the St Vincent and the Grenadines Diaspora Committee of New York, Inc.
o	The work of the National Sports Council to upkeep all playing facilities in St Vincent and the Grenadines (Playing Fields and Hard Courts). o	Current renewed discussions by the Ministry and National Olympic Committee on phase 1 of the National Stadium Project. o	National Sports Awards as a major incentive programme. o	National Sports Council to review National Sports Policy and the incentive programme along with Stakeholders. o	Appointment of Sporting Ambassadors. o	EC$6.5 M has been made available and will be spent in 2015 to upgrade Playing Fields and Hard Courts throughout St Vincent and the Grenadines. o	Honouring and paying tribute to past soccer players. o	Honouring players for their contributions to cricket, netball and track and field. o	Promoting a Soccerramma tournament and a Windward Islands sports tournament in the USA. o	Promoting efforts to build a multi-purpose Vincentian centre in New York. o	Encouraging partnerships with relevant persons and organizations in SVG and elsewhere. o	Stimulating sports exchanges between SVG and diaspora. o	Making Vincy soccer in the USA stronger. Sunday football in New York brought dignity and joy to Vincentians in the USA for several decades; a big salute to all those players and fans that made it happen. o	Establishing a committee to raise funds to send players to SVG in preparation for the next World Cup using a similar format as the committee formed in the 1990s. o	Advancing SVGâs position internationally in sports and academics. o	Recognizing that sports is a trillion dollar industry and we should cash in on it. o	Focusing on sports tourism which will contribute to SVGâs GDP. o	Recognizing that the building of a stadium for track and field, soccer, etc and an international airport are necessary to take our sports forward. o	Becoming a Sports Ambassador is not just his opportunity, but for all Vincentians. So we must endeavour to do our part. o	He plans to be very accessible and to seek guidance in his work as Sports Ambassador. o	His intention to work indefatigably and with integrity to work on behalf of Vincentians. o	The Steering Committee to establish the association should have representatives from each sporting discipline. o	The need to explore integrating young Vincentians in New York to contribute to sports development in SVG. o	Getting people to participate in building organizations is a challenge; we need to overcome this challenge. o	Schools in New York now have cricket teams. Vincentian sports persons, sports organizations, and Vincentian parents in New York must become aware of this development and encourage their children to make use of this opportunity. o	There is a need to revive netball in New York among Vincentian young people, especially when seen in light of the outstanding contributions of Vincentian netballers to the sport in the USA. o	More efforts are needed to get Vincentian students from SVG go to the USA to further their sports interests and education. o	The diaspora sports association will help to identify Vincentian sports players in the USA. o	It is important to use Caribbean political representatives in congress to promote and support sports activities among Caribbean communities in the USA. o	Partners in SVG should be more responsive to diaspora outreach to them so initiatives can move smoothly. o	There is a need for more public information to know what is going on in sports in the USA so we could participate in them. o	The diaspora needs more information on the needs of sports in SVG. o	The media in SVG must be used more by Vincentians sports persons and organizations in the USA. o	Need for the diaspora to have its own awards which will feed into the national sports awards event in SVG. o	A data base of sports persons and organizations should be created. o	Interaction among the leaders/heads of all Vincentian sports organizations in the USA should become the norm. o	The Steering Committee and the eventual sports association should remain an entity of the Diaspora Committee. The Steering Committee will be meeting in February to continue the process in a definite way to create the Vincentian sports association in the USA.